This article was inspired by Ms. Marie-Pierre Langis, project leader for the Circuit gourmand, la nature aux mille délices, who submitted the topic as part of the contest to select the 1000th TIN analysis. Our thanks to everyone who took part, as well as our partner, Air Transat! Thematic tourist routes abound in Quebec and around the world; there are routes to discover vineyards, cider, flowers, whales, heritage, history, the farming community, the arts and the St. Lawrence. Visitors can explore them on their own, guided and informed by a GPS, an MP3 player or a smart phone; the number of formats available is on the rise. Technology is enhancing the appeal of this type of tourist product, offering a wealth of possibilities in addition to meeting the needs of autonomous yet demanding tourists who seek experiences related to their personal interests. Welcome to a “tour” of some innovating and inspiring initiatives, as well as some of the factors behind their success. Happy trails! What exactly is a tourist route? A tourist route follows an itinerary featuring various sites of interest to tourists. The term “tourist circuit” is most often associated with a loop, while a “route” usually has different starting and ending points. However, these terms are not limited exclusively to these definitions. Routes vary widely in length, content and mode of transport (e.g., on foot, by bike, car or coach). Some are comprised of attractions aimed at the general public, while others group together sites of interest to a niche market. In urban, near-urban and rural environments, tourist routes and circuits are an ideal vehicle for systematically developing and marketing a carefully planned tourism product. A means for local stakeholders to work together, routes also give regions, which are sometimes off the beaten path, an opportunity to differentiate themselves and attract new visitors. At the same time, travellers enjoy being presented with a number of clearly identified activities along the way that correspond to their interests. According to Tourism Queensland, the partners involved in a thematic tourist route must make a commitment and, although they can be used to represent a large number of products, a single bad experience can ruin the reputation of all the participants along the route. After explaining how tourist routes work and listing the pitfalls to avoid, the guide provides a flow chart of the entire process, listing all the steps involved and the organizations to consult at each stage. By taking the reins, Tourism Queensland is helping ensure that its tourist routes are developed systematically and are of high quality. A route’s use of effective marketing technology is increasingly a factor in its success. Well-equipped visitors–and there are more and more of them–want to be self-sufficient and appreciate being given the means to do so. At the very least, a route must have a Website with dynamic mapping and the option of printing the map. Many destinations now provide MP3 audio guides for download. Now, however, mobile technology is becoming indispensable, thanks to the myriad possibilities it offers. Several destinations have developed mobile applications or created Websites that enable users to view the route directly on their smart phone or GPS, locate businesses through augmented reality or even access a wealth of information simply by scanning 2D barcodes (Flashcode). GPS et tourisme: Suivez la direction! 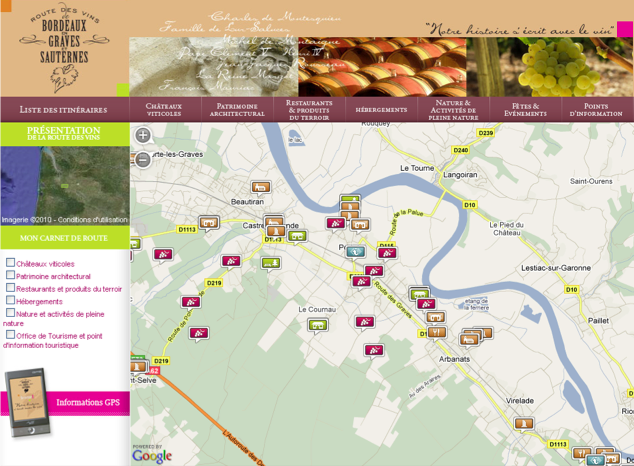 The Route des vins de Bordeaux en Graves et Sauternes Website suggests itineraries that encompass a number of wine-themed regional attractions. Simple and easy to use, the site features a dynamic map illustrating the location of the selected itinerary’s attractions, or visitors can use the map to plan their very own route. Local tourism bureaus also rent out multimedia GPS units to visitors, who can then follow a route at their own pace, receive alerts when they get close to a site of interest and view nearby restaurants. They can also create their own route by selecting the types of sites that interest them. A personalized, self-guided tour enabled by technology—now that’s a 21st-century tourism product! Tarn Tourisme, another French organization, offers a free iPhone application that presents seven tourist circuits for exploring the region by car. Travellers follow a map identifying the attractions or a list of steps displayed on their cell phone screen and get information from the videos, audio commentary and photos provided by the application. Certain stages of the route feature a family quiz. This is an excellent way to motivate children when sightseeing, for the teams with the best results of the week win prizes! 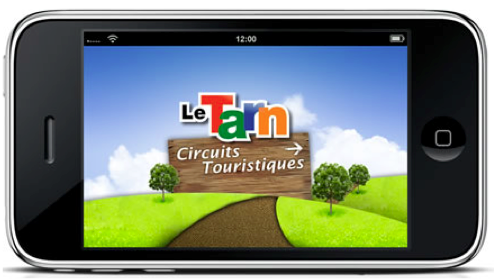 For more details, view the Tarn Tourism video (in French) that introduces the mobile application. 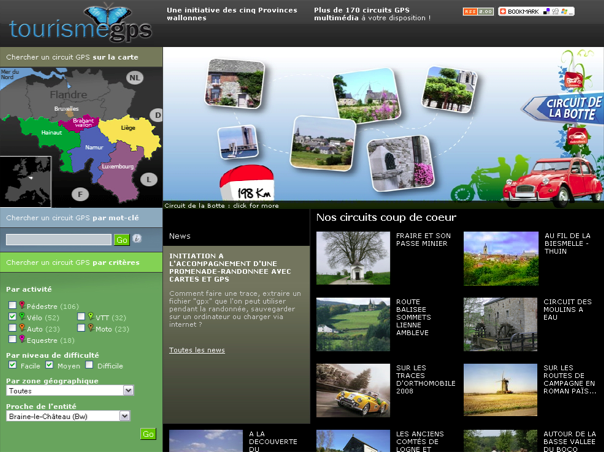 To improve and better coordinate the promotion of tourism in their regions, five Wallon provinces in Belgium have developed several initiatives, including Tourisme GPS, a collection of more than 170 multimedia GPS tourist circuits downloadable from the Website. Visitors input their preferences, such as mode of transport, geographic area or starting city, use key words or select a route from a list of favourites. Tourisme Québec lists some 46 thematic tourist routes and circuits, while the Association de l’agrotourisme et du tourisme gourmand (formerly the Fédération des Agricotours du Québec) proposes forty or so on its site under the heading “Québec Routes and Circuits for Food Lovers.” There are also a number of local initiatives that enhance what Quebec has to offer tourists. It would appear that this type of tourist experience is particularly attractive to non-Quebeckers. In fact, visitor statistics from the Bonjour Québec.com site show that markets outside Québec have a greater tendency to opt for this type of product. Approximately one-third of site visitors overall are from outside the province, but this number climbs to nearly 60% when the topic is specifically tourist routes and circuits. Quebec could actually take some inspiration from the Tourism Queensland initiative. For example, a comprehensive, planned strategy would give businesses wishing to develop a tourist route or circuit a procedure to follow. Such a strategy could also be used to organize a destination’s different themed attractions into separate centres of tourism, leading to more effective marketing on the global marketplace. Technological tools, shared strategies, unique routes—let your imaginations run wild! – Berki, Mónika and Janos Csapó. “Existing and future tourism potential and the geographical basis of thematic routes in south Transdanubia, Hungary,” University of Pécs, Faculty of Sciences, Institute of Geography, Department of Tourism, 2007. – Lourens, Marlien. “Route tourism: a roadmap for successful destinations and local economic development,” Development Southern Africa, Vol. 24, No. 3, September 2007. – Rob Tonge & Associates, Queensland Heritage Trails Network, Queensland Government and Tourism Queensland. “Developing & Marketing Tourism Drive Routes”, June 2004. – Rogerson, Christian. “Tourism Routes as Vehicles for Local Economic Development in South Africa: The Example of the Magaliesberg Meander,” Urban Forum, Vol. 18, No. 2, Springer Science and Business Media B.V., 2007. – Zins Beauchesne and Associés. Agrotourisme : Diagnostic sectoriel/plan de développement et de commercialisation – Rapport d’analyse de la situation et diagnostic sectoriel, June 2006.